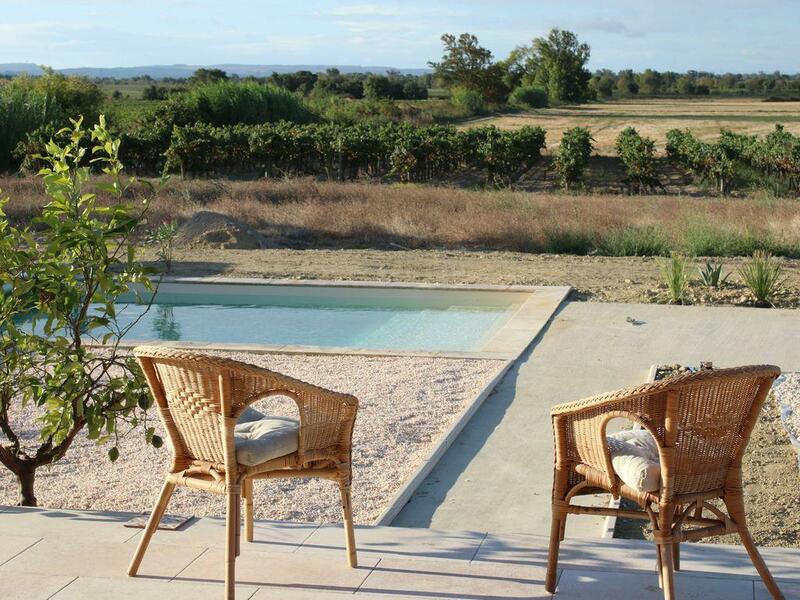 Le Gite Rouge is a brand-new property located in the village of Capestang in the Languedoc. This property is perfect for two families, a multi-generational family or groups of friends as it is two gites that can be rented as one, giving everyone the privacy they need whilst being close for time spent together. Boasting stunning views towards the Pyrenees, a private saltwater swimming pool, WiFi, large garden and terrace. 5 bedrooms and 2 bathrooms sleeping up to 10 people. If you're looking for somewhere fantastic to spend your holiday, look no further. Very elderly-friendly as everything is one level with walk-in showers. FLEXIBLE START DAYS THROUGHOUT THE YEAR. MINIMUM 7 DAY BOOKINGS JULY AND AUGUST. Le Gite Rouge was built with the aim to provide a comfortable location for families to holiday together, whilst providing as much privacy as possible; this is made possible by how the property is separated into two independent gites. As you enter the hall you will see the two entrances to the separate gites (one for 4/5 people, the other for 6/7). Little Gite: Kitchen area with Fridge/Freezer, hob, oven etc. Seating and dining area for 4 people. One double bedroom + 1 bedroom with bunk beds. Walk-in shower and double sink unit. Big Gite: Kitchen with island. Fridge/freezer, hob, oven, microwave etc. Two x double bedrooms + 1 bedroom with bunk beds. Walk-in shower and double sink unit and WC. The kitchen/dining/living room is open plan and modern, designed for comfort and practicality, giving you everything that you should need during your stay and opens onto the garden and private swimming pool. In the summer months, the big French windows open up onto the terrace giving the feeling of living outside inside, or even inside outside! There are 5 bedrooms total in this house. The outside area boasts a private swimming pool, gravelled area and terrace which all overlook the vineyards and fields, offering a stunning view to gaze at whilst you relax. There are no other buildings in view - just vineyards stretching to the Pyrenees in the distance. Other facilities in this property include heating, Wifi internet and a TV (French channels only). All the facilities of thricing Capestang are within walking distance. There is a shop selling local produce at the end of the road and a good baker's about 200m away. There are several other boulangeries in the village, a large supermarket about 500m, and the village boasts several bars/restaurants. Its proximity to the Canal du Midi means there is a selection of eateries within walking distance. 2 bathrooms with walk-in showers. This holiday home is located in Capestang, a thriving traditional village which has everything that you would need such as boulangeries, restaurants, bars, a tennis court, markets, shops etc. Located only 25 minutes from the coast and situated directly on the Canal du Midi, offering pleasant evening strolls along the towpath. Prices based on maximum capacity of 10 people. Taxe de séjour: €1 per person, per night, payable to the owner upon arrival. FLEXIBLE START DAYS THROUGHOUT THE YEAR. MINIMUM 7 DAY BOOKINGS JULY AND AUGUST. - Private saltwater swimming pool 8m x 4m. Shallow steps to get in but not fenced. Wheelchair access and access for the infirm: This property is all on one level with walk-in showers but the doors are 80cm wide (standard recommended is 90cm). The pool has shallow steps (no handrail).